Selecting the right padlock for your needs is not all about cost, class, and style. Unlike a decade or two ago, they are now so many different types of locks that you can get spoilt for choice and forget your target application. 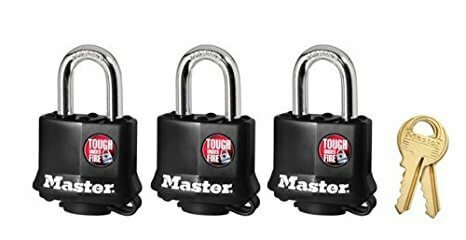 These include weatherproof padlocks, combination locks, master padlocks, and even keyed alike locks. The more valuable your possessions, the more burglars will be determined to pick your lock and make away with the items. You’ll, therefore, need to spend more on a higher security padlock. If it’s an office safe, you need a heavy-duty steel or boron padlock; if it’s your gym locker, get the best lock for gym lockers and so on. This means that a padlock is like a one-time insurance payment that you make for your valuables, relative to their worth. When using a padlock indoors, it will be less exposed to weather elements and thus you don’t have to worry about corrosion resistance. However, outdoor applications vary from mild to extreme weather conditions and the lock needs to withstand. For instance, a gate lock is exposed to heat and rain. A hardened steel shackle padlock suffices because it will just discolor but corrosion won’t clog the internal key profile as long it is properly oiled. For marine use, an ordinary padlock will be exposed to humidity and salts leading to rusting and jamming of the internal locking mechanism. What you need is a laminated weather-proof padlock. Another environmental aspect when it comes to padlocks is the structural integrity of the locker, door, gate, safe and so on, that you are targeting. It makes sense to say that the locker and its accessories such as chain or hasp should match the padlock’s security rating. For instance, it’s useless to lock a rickety door with a heavy duty master lock. If you are managing several padlocks, you may consider master or keyed alike padlocks so that you don’t have to carry hundreds of keys. Similarly, if multiple people need to access the same locker, you may want to consider a combination lock so that you don’t have to give out hundreds of keys. Padlock material varies depending on the security level. Plastic and brass made locks are the cheapest and least secure padlocks. Stainless and hardened steel locks are for mid-security to high-security use. Boron is appropriate for industrial and some commercial applications while molybdenum finds use in defense, nuclear and space industries.